We have now made more than a dozen round trips on the ICW between the Florida Keys and the Chesapeake, the first being almost two decades ago. Since that first trip, we have seen many, many changes. Some are positive and many not so. It was during this last trip that we really had the opportunity to ponder those changes and how they affected our perception of the waterway. We still remember the awe and wonder we enjoyed on that first trip. We also remember the anxiety and anticipation of the unknown. There is almost one article each month in almost every boating publication that covers some part of it. In this article I would like to reflect on those changes we have seen and experienced. At the time of the fuel crisis of the 1970s trawler yachts enjoyed a brief period of increased popularity when fast powerboats, with fuel-guzzling engines, fell out of favor among powerboat owners. But, as boaters became more and more used to paying higher prices for fuel and the relative cost of fuel dropped, fewer people seemed to find these slow, plodding vessels attractive and their popularity waned. However, driven by aging sailors searching for less demanding vessels and retires in search of a slower paced boating lifestyle, the last several years have seen a resurgence in the popularity of this type of vessel to the point that market demand has outstripped the supply of some models. This style vessel is what is commonly referred to as a trawler yacht due to its resemblance, in appearance, to a commercial fishing trawler. The Marine Trader 34 Double Cabin is 33’-6" in length overall with a 30’-3" waterline length a maximum beam of 11’-9" and draft of 3’-6". The hull has a V-shaped bottom with a sharp entry forward that flattens considerably at the stern. There is an integral keel that runs nearly the entire length of the vessel. 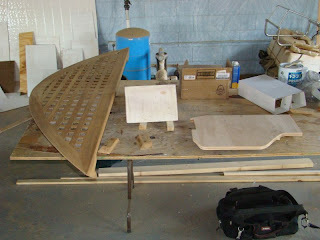 The keel fairs into the bottom near the bow and drops more than two feet below the bottom near the stern affording protection for the propeller and rudder. Storm season is only a few months away so consideration needs to be given for what projects take priority. One important one not yet completed is the anchoring system, so that has become number one on our list. Early on. the windlass was mounted on the anchor platform but that was as far as it went and no electrical has been connected nor the new anchor rode and anchor installed. As with other projects, this one needs to start from scratch and get the entire system done right the first time so we won't have to redo it or make any repairs any time in the near future. 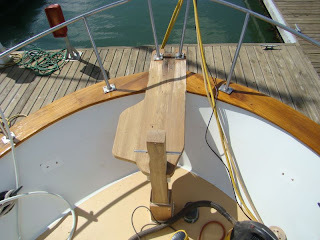 The platform that holds the windlass and the anchor roller is teak and in the same condition as the rest of the teak on the boat. Under that platform is another that is grated and gives us working space and a stowage area for lines and fenders and whatever. It all needs some serious reconditioning and we gave a lot of thought as to how and what we wanted to use to refinish the whole area. It is really not practical to redo the area with Cetol since it will get a lot of use and abuse raising and lowering the anchor not to mention cleaning the rode constantly with the wash down system. Once again we used what worked on our previous boat and decided that the area would benefit from a good painting. Our paint of choice is AwlGrip. The temperatures here in South Carolina reached near 80 degrees this past weekend, only a few days after we had seen highs in the 40s and lows in the 20s, so it was just too nice of a day to sit in the slip and work on projects. Every once in a while we have to stop and tell ourselves to enjoy the boat and not work on it all of the time. As we have refitted each boat for cruising. we have worked hard and long getting equipment installed and repairs made so when the time came to head out on a cruise, we untied the docklines and were still doing projects. This time we will spend some time on sea trials and using the boat and new equipment we install before we start our next cruise. No not rain showers. 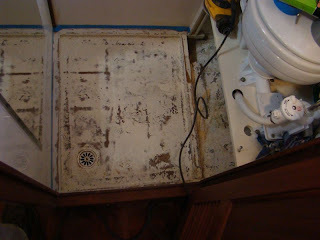 Although the boat is now 28 years old, apparently none of the previous owners ever showered aboard. There were no drains or plumbing to allow anyone to shower in either head and since we seldom use marinas when we are cruising, and quite often spend our time in remote areas, the ability to take a daily shower is important to us, and important to morale. We knew from the beginning that we would need to install a shower but since we are tied to the dock with showers close by, other more important items on the to-do list took precedent. But the project finally came to the top of the list and the time is now. 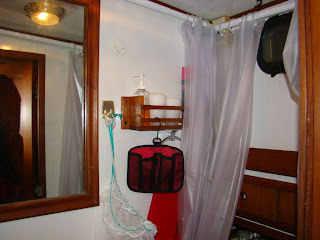 One of the things we always stated as a requirement for a boat was a separate shower stall. 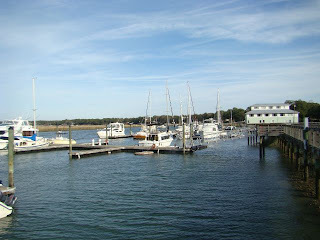 Our last sailboat did not have one and the new trawler does not either. But this time we did have a good alternative. Beach House has two heads, one in the main stateroom and the other in the forward cabin. We seldom have guests aboard for long periods so having two heads is not important to us. The forward head is also small, having the head, a pull out sink and the beginnings of a shower pan. From the beginning, we planned to convert this smaller head into a dedicated shower.